Chapman Road in the Town of Hector began to collapse over the top of a large culvert crossing. This was caused a by a failed gabion basket headwall system. Gabion baskets are a very effective tool in stabilization and used extensively over for many decades. However, the one downside is that once the baskets themselves become compromised from water and time, the results can be catastrophic because the entire rock stabilized area can let go all at once. Thanks to our extremely talented equipment operator, Jim Barrett, we were able to work with the Town of Hector to replace the collapsed area with an intricately stacked rock wall utilizing large rip rap. This project couldn't have been completed without the assistance of the Town and the Towns equipment. The rip rap itself was purchased through grant funds by the Soil and Water District, this component of the project was over $20,000 itself. 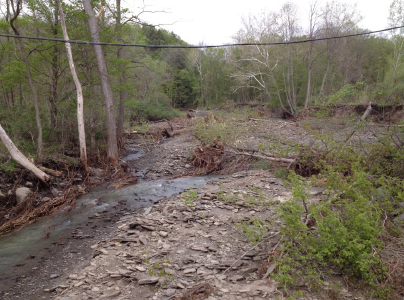 The Schuyler County Soil and Water Conservation District was able to stabilize a segment of streambank on Coats Road in the Town of Hector. This project was very important because recent large storm events in the area caused an old wall made of timbers to collapse. 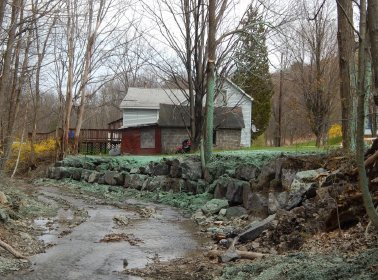 This erosion threatened both the home and septic on the property. Thanks once again to the assistance of the Town of Hector for the use of equip-ment and Daniel Thorpe, as an additional operator, the project was able to be completed in a timely manner. Additional equipment was utilized from the Chemung County Soil and Water Conservation District as well. A sloped rock wall was installed with several cross veins to help stabilize the area. 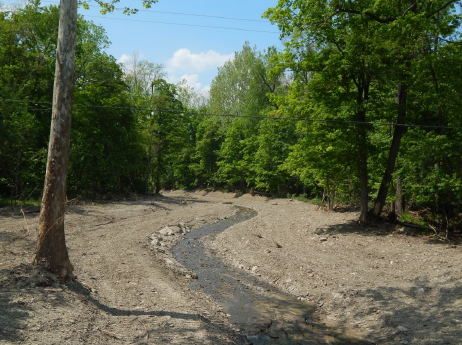 The Schuyler County Soil and Water Conservation District was able to stabilize a waterway that outlets directly to Lamoka Lake. This waterway had become blocked with sediment causing erosion, posing a threat to flood adjacent cottages. 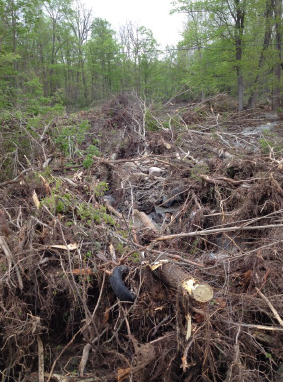 With the use of Chemung County Soil and Water’s excavator, the Schuyler Soil and Water Conservation Districts Federal Surplus dump truck, and topsoil from the Town of Tyrone the district was able to remove the debris and stabilize this area. 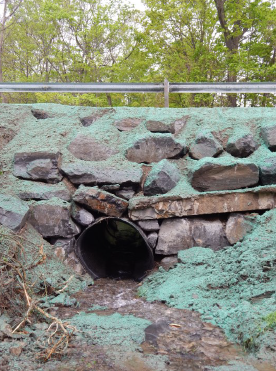 Because of lack of slope and slower velocity on this waterway we were able to utilize erosion control fabric to stabilize the banks of the waterway itself. 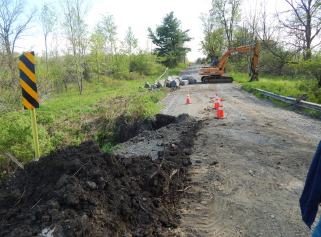 We were able stabilize an eroding waterway that threatened a home, a farm field, and caused flooding to Hallock Road itself in the Town of Tyrone. 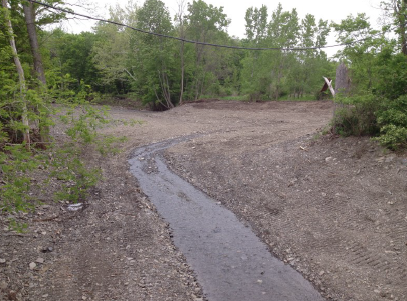 We were able to accomplish this project with the use of Chemung County Soil and Water’s Excavator, and Loader, as well as rip rap obtained from grant funding. The severe flooding that occurred in 2013 in the Town of Cayuta caused some significant damage. One of those sites eroded a property leaving multiple out buildings hanging over the stream and a home itself threatened. We were able to utilize multiple cross veins, rock barbs, and stacked rock wall to stabilize this area. This was once again done very efficiently thanks to the assistance from the Town Highway Department. The Town of Cayuta provided a loader and operator to assist us with this project. A bank collapse on Pearl Street in the Town of Dix threatened to expose a cemetery plot. The Soil and Water Conservation District was able to install toe rock stabilization, and take care of several other projects while on site. 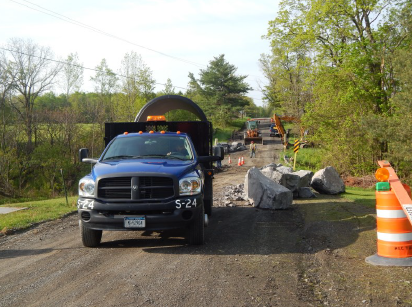 A stacked rock wall was put in place where erosion threatened a home and garage, and assistance was given to the Town in installing a crossover pipe on the road as well. This was possible with use of the Town of Hector excavator. 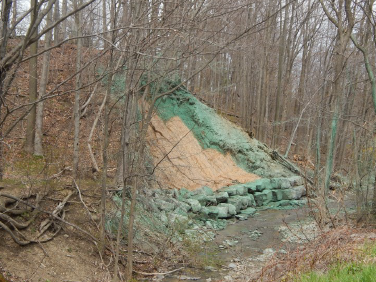 The Soil and Water District was able to stabilize a significantly eroded and encroaching bank on County Road 22. This eroded area posed a potential safety issue and threatened the road itself. We were able to complete a toe rock stabilization project and utilize erosion control fabric to help stabilize the slope. 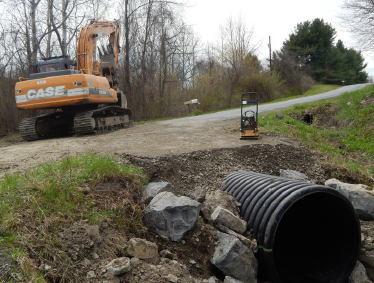 Bassett Road in the Town of Hector collapsed over a cross over pipe due to a gabion basket failure. Once again the Town Of Hector Highway and the Soil and Water District worked diligently together to rectify the issue. The stabilization was done by putting a pipe extension on the cross over area to allow for a decrease in slope to the road itself. The area was then stabilized utilizing rock rip rap, cost shared by the Soil and Water with grant funds. A unique source of funding was utilized to cost share a several thousand foot stabilization project on Hencoop Creek through the National Fish and Wildlife Foundation and the National Turkey Federation. This significant undertaking involved over 15 structures, stream-co willow plantings, and nearly $50,000 in rip rap alone. Without a great deal of assistance from the Town of Hector Highway Department this project wouldn't have been possible. Sheet piling collapsed causing severe issues to Chicken Coop Road. Hencoop Creek itself has been incising for a very long time, making it very unstable. 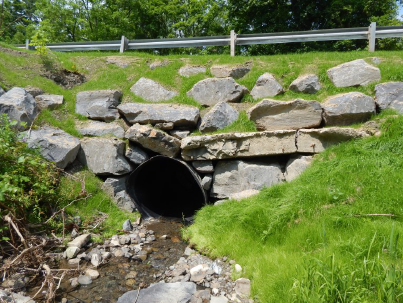 This project aided in stabilizing Chicken Coop Road itself, and most importantly is working to find a balance between incision and deposition for this stretch of Hencoop Creek itself. A joint effort was put together to assist Yates County and specifically areas near Penn Yann that were hit very hard by the devastating flood this spring. This assistance was made possible by use of the Town of Hector Excavator, our jointly owned bulldozer, Chemung Soil and Water Conservation Districts loader and dump truck along with a multitude of staff. Mark Watts from Chemung Soil and Water guided everyone on Emergency Stream Intervention, a statewide recognized program first created and instituted by Delaware County Soil and Water. County Highway equipment operator, Art Austin, was instrumental in assisting Jim Barrett complete the project with numerous amounts of assistance from the Yates County Highway and Soil and Water Conservation District.